For me, drones come right after leaf blowers. I find the noise generated by the increasingly popular flying machines extremely annoying. Drones sound like mutated giant bumblebees. Torture for my ears. But even I have to admit: On the eight-thousander Broad Peak in the Karakoram in Pakistan, a drone and the guy who flew it did a great job. Eight days ago, on 9 July, the 64-year-old Briton Rick Allen set off alone for a summit attempt. 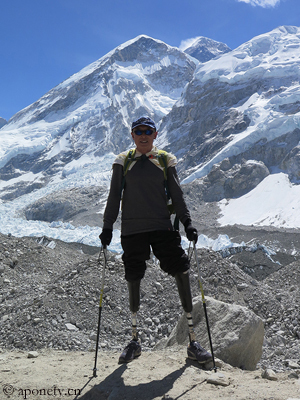 His teammates stayed in Camp 3 at 7,000 meters. When Rick didn’t return, they sounded the alarm because they feared Allen might have been injured or even died. 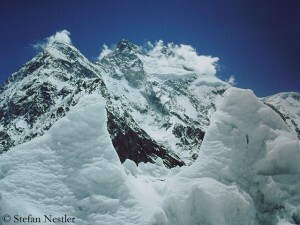 Sandy Allan, who had already descended to base camp due to strong winds in the summit area, contacted the Polish Bargiel brothers in the nearby K2 Base Camp. Andrzej Bargiel is planning to ski the second highest mountain in the world from the summit to base camp for the first time this summer. His brother Bartek is filming the project – also using a drone. In the fifth attempt, Xia Boyu made it. As Mingma Gyalje Sherpa, expedition leader and head of the Nepalese operator “Imagine Trek and Expedition”, wrote on Facebook, the 69-year-old Chinese was among 14 members of his team, who today reached the summit of Mount Everest at 8,850 meters. Among the summiteers was also Nima Jangmu Sherpa, the first Nepali woman to scale Everest and neighboring Lhotse in one season. 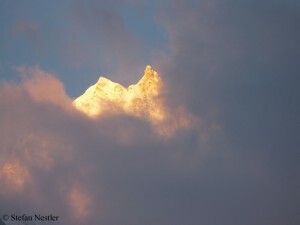 She had also been part of the Mingma-led team that had succeeded the first eight-thousander summit success of the spring season on 29 April on Lhotse. This year’s first summit successes on Manaslu are reported: Chhang Dawa Sherpa, head of the Nepalese operator Seven Summit Treks, said that nine foreign mountaineers and six Climbing Sherpas summited the eighth highest mountain on earth this morning. More teams are on the way up and plan to reach the highest point at 8,156 meters on Thursday or Friday. Dan Mazur from Summit Climb tweeted from Camp 4 at 7,450 meters announcing to climb towards the summit tonight. Rainer Pircher from Amical alpin is in Camp 4 too. Dominik Mueller, head of Amical, and his clients are spending the night at Camp 3 at 6,800 meters and want to climb up to Camp 4 on Thursday.